Here by SalesVu is a yoga studio management app designed to provide users with the tools to create and manage yoga class schedules, plus sell classes and packages directly from their iPad. Here also supports customer registrations, memberships, loyalty programs, automated class renewal and billing, and more. Here is free for one iPad terminal, giving users the flexibility to manage their yoga classes and schedules anytime, anywhere via their iPad device. Here also supports 24/7 customer service. With Here, users can sell classes and class packages easily, plus quickly check-in customers online via their iPad. The check-in screen allows staff to quickly check who has registered. Users can also create and manage their class schedules, as well as keep track of customer memberships. Here automatically counts and records when customers check in for a class. The loyalty program feature allows customers to collect and view accumulated points, then utilize these collected points for certain purchases. Here assigns classes to customers instantly, and supports the auto-renewal of classes and billing. The calendar section allows users to view customer information along with details on the classes they have purchased. - Sometimes it takes me awhile to figure out that what I want is actually possible. And sometimes I never find it. Like a list of all payments for one specific customer. It's probably there, I just have to play around too long to find it. Quickbooks has that information, so I don't SalesVu to get it for me, but if others are relying only on this to keep track of sales records, it might be frustrating. - You can't just run a credit card payment. You have to make an order for that amount first (which I don't need, since I use Quickbooks for invoicing), then pay the order. I only want to use it to run credit cards, but I have to do double record keeping in order to do it. I just like that it's really easy to use, my client hasn't expressed any concerns, and when they bring on new staff they never seem to have problems learning the process.Reports work well and it's easy to "dig deeper" for information when data is questionable. Product are easy to set up and you can use modifiers (i.e. sizes and colors) for inventory tracking. My client is in an area with various sales tax rates and SalesVu handles them beautifully. Customer support is responsive although I seldom need them. Reports work well and it's easy to "dig deeper" for information when data is questionable. Product are easy to set up and you can use modifiers (i.e. sizes and colors) for inventory tracking. My client is in an area with various sales tax rates and SalesVu handles them beautifully. Customer support is responsive although I seldom need them. Here by SalesVu is free app for one iPad terminal. Additional charges for cloud services only. Sell yoga classes and class packages conveniently online using the Here app. Check-in customers online via the app. The central check-in screen allows staff to quickly see who has currently registered. Here assigns classes to customers immediately and supports the auto-renewal of classes as well as the automated billing of classes. Users can create and manage their yoga class schedules directly on their iPad. The calendar section allows users to view customer information alongside details of the classes they have purchased. Here automatically counts and records when a customer checks in to a class, allowing users to keep track of customer memberships and class balances. The customer loyalty program allows customers to collect and view accumulated points and utilize them for certain purchases. Below are some frequently asked questions for Here by SalesVu. Q. What type of pricing plans does Here by SalesVu offer? Q. Who are the typical users of Here by SalesVu? Q. What languages does Here by SalesVu support? Q. 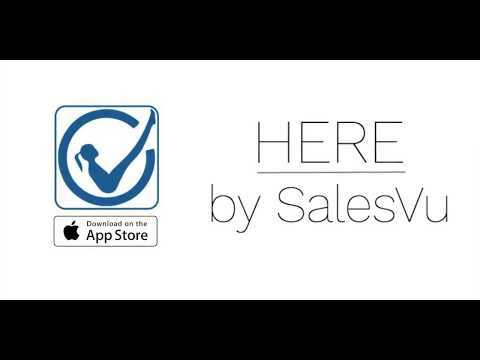 Does Here by SalesVu support mobile devices? Q. Does Here by SalesVu offer an API? No, Here by SalesVu does not have an API available. Q. What other apps does Here by SalesVu integrate with? Q. What level of support does Here by SalesVu offer?